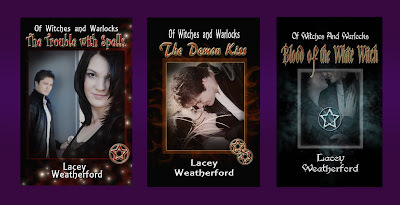 Of Witches and Warlocks: Happy New Year and Happy Make Over too! Happy New Year and Happy Make Over too! Bringing in the New Year is always a great opportunity to make things fun and fresh, and we are certainly getting to do that here at Of Witches and Warlocks! Along with the new look of our redesigned webpages, we are getting a makeover for not one, but two of the books! Book one, The Trouble with Spells, will be getting a NEW LOWER PRICE, NEW INTERIOR FORMAT, and a NEW COVER when it makes the move over to it's NEW PUBLISHER, Global Authors Publications, the wonderful company which produced books two and three of this series! 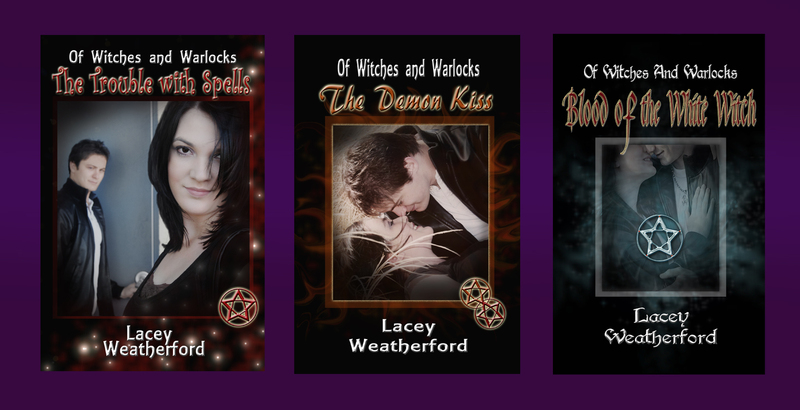 Since this means that The Troubles with Spells will now be getting a cover that 's more in keeping with the design of book three, Blood of the White Witch, we couldn't leave out book two, The Demon Kiss! It will be getting a new cover to match the look as well. The above photo will give you an idea of the current mock-ups, but be aware these are not the official images yet. We will post those as soon as we get them! If all of that NEW doesn't excite you, then try this one. After the re-release of book one, all of the books will also be made available in e-book format, usable on every e-reader currently available on the market. 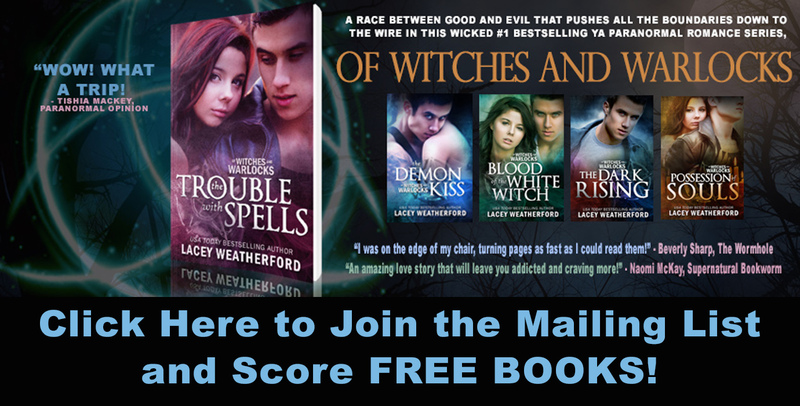 This means instant downloads of the series at the extremely reasonable price of $3.99 per book! So when is all of this NEW stuff happening? These projects are all currently in the works as you read this post with a projected time frame of the end of February 2011, if everything goes on schedule! Be sure to keep an eye out for the release of book four, The Dark Rising, this coming year also! It will be release sometime in April! In other news, you may have noticed we've streamed lined the site a bit, getting rid of some of the pages. There are too many reviews of the books to keep up with on a review page now, so we suggest you search the books on sites like Goodreads, to check out other reader/blogger reviews. Also, any upcoming media events such as book tours/signings will now be posted on the home page for easier viewing access. There should be a book tour happening in March. We'll post those dates when we get them! We will post links here to new blog/radio/television interviews with Lacey as well. You may have noticed a new page listed in the navigation bar. The Delusional Diaries is Lacey's book review site, so hop on over there for some of her reviews on some great books by other authors that are out there right now. Of course, we kept our fan favorite pages. The Sample Chapters page will give you a little taste of all the books that are currently published, including chapter one of book three now, and the Character Stories page has some fun little tales in it too. And there was no way we would get rid of one of the most popular pages on the site, the Matt Lanter page. That page rakes in hundreds of hits daily and we are thrilled to have the opportunity to promote Matt! He's such a great person, and we can't stop loving him since he was the inspiration behind our beloved Vance Mangum. So be sure to check him out and give him some support too! We hope you will keep coming back to check out the new things that happen with us this year, and we hope that you will all have a great NEW YEAR too!! Be Safe!! Looking forward to all that 2011 has in store for the series! Super excited to find out what happens in "The Dark Rising." Why must the first half of the year seem to go by so slowly? Second Edition of The Trouble with Spells coming!